This guest post comes courtesy of the wonderful Amy Kinsler, parent advisor at St Joseph’s Hospital in Denver, Colorado. Thanks, Amy! Like most NICU parents, my husband and I felt very overwhelmed when our son was first admitted to the NICU. We had gone from planning his nursery to active labor in a matter of days. One of Kelly’s primary nurses made a point to suggest that we bring in a photo of ourselves and maybe a small stuffed animal to put in his isolette. My first reaction was annoyance; how dare she suggest something as normal as a stuffed animal or a photo in such a life and death situation? Even though I was desperate for normalcy, I was scared to introduce it. But as I warmed to her ideas and some of our own, they have become some of my most treasured memories in the NICU. Within a few days of my son’s NICU stay, I bought him a small stuffed monkey in the hospital’s gift shop. I felt apprehensive at first – was this appropriate? Was I going to look like a mom in denial? But as soon as I purchased it, I felt better. Putting it in his isolette made me feel even better. I was bonding with him and giving him memories. That night, my husband starting reading books to him. We started to bring books on a regular basis to read to him. It not only took our minds off of where we were, but Kelly got to know our voices and enjoy time where we were speaking right to him. A study done at The Montreal Children’s Hospital of the McGill University Health Centre in Montreal, Quebec, Canada looked into introducing a reading program to infants in their NICU. One hundred thirty-six parents of babies in the NICU were assigned to either a group that used the “Books for Babies” reading program, or a control group that did not use the reading program. Parents using the reading program read to their baby a few minutes every day. Three months after discharge, twice as many parents (55.9%) who used the reading program reported reading three or more times a week to their babies, compared with the control group (23.3%). The study concluded that reading to babies in the NICU not only helps parents interact with their babies but it also promotes future reading (1) (2). The entire study can be found at Journal of Developmental and Behavioral Pediatrics. Similar to the study’s findings, my husband and I felt much closer with our son and we continue to read books to him nightly. We are forever grateful to his nurse for getting us on this path and helping us to cultivate a love of reading as well as helping us to bond during such a chaotic time. (1) Lariviere J, Rennick JE. 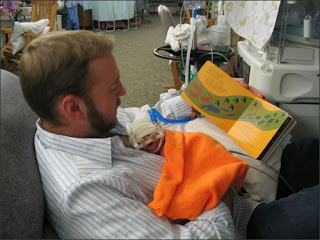 Parent Picture-Book Reading to Infants in the Neonatal Intensive Care Unit as an Intervention Supporting Parent-Infant Interaction and Later Book Reading. J Dev Behav Pediatr 2011;32:000–000.